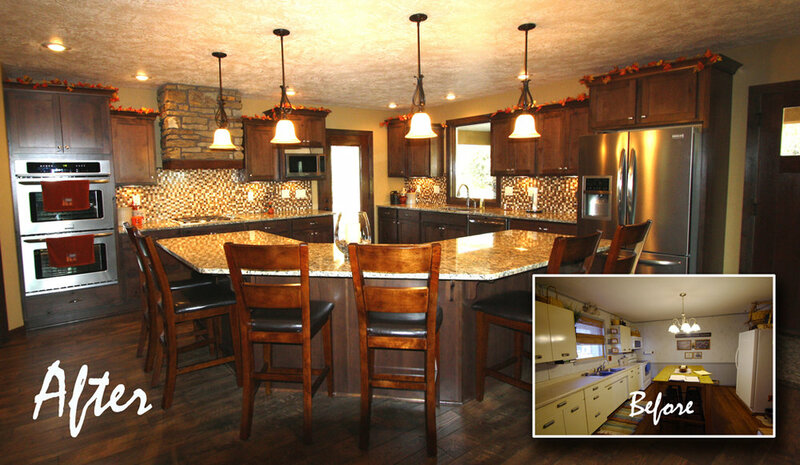 As a leading custom home builder in South Dakota, G.A. Johnson Construction is the right team to bring your dream home to life. Watching your ideas come together is a rewarding experience. We promise you will feel like you are a part of our family by the time you turn the key on your new home. As a residential Custom Home builder for the Midwest area, G.A. Johnson Construction has built many styles of homes including ranch, split-foyer, two-story, cottage, mansion, lake home, and even a shouse! With our in house designer, we will lay out the plans in 3D so you can see your dream home before we break ground. You get to be involved in every step, picking out colors, counters, flooring and more. Our Custom Home Building division provides quality new homes, renovations, remodeling and additions. G.A. Johnson’s team will design and build your dream home, allowing you be involved every step of the way. Maybe you like your current home, but you aren’t “in love” with it anymore. A kitchen or bathroom remodel, home addition, garage extension, or a new deck or patio may be your answer. We strive to show our clients that we care about their home and treat it as if it was our own. We show attention to every detail proving that the crew that shows up has the specialized skills to show you what “Experience Builds” really does mean. Here is a sample of our past and current residential projects.